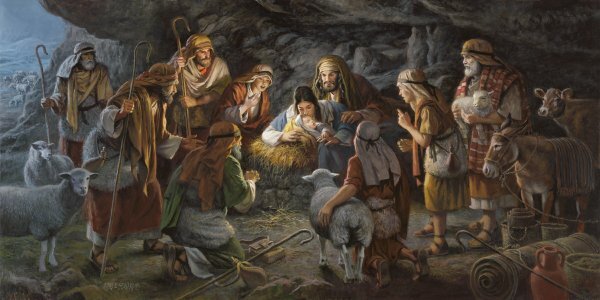 This painting of the Nativity depicts Jesus beginning his life as a human being. Remember the popular verse in John 3:16: "For God so loved the world that he gave his only begotten Son, that whosoever believeth in him should not perish, but have everlasting life." Isaiah 7:14 says, "Behold a virgin shall conceive and bear a son, and shall call his name "Immanual," which means God with us. Many times in the New Testament he is called the Son of Man. He was fully human yet was totally God at the same time. The question arises: How could he be both at the same time? Jesus gave up his prerogative to function as God to live only as a human, just like you and me. As a human being he trusted and relied on the Father in the same manner that you and I ought to. He did not live a life that He generated himself. He relied on the fact that the Father lived His own life through Him. John 14:10 states, "…but the Father that dwelleth in me, He doeth the works." Two things were to be accomplished: first, He would be the sacrificial lamb, to be offered at the cross. Secondly, He showed the pattern to us of how we are to be vessels by which Jesus could live through us. II Corinthians 4: "But we have this treasure (Jesus) in earthen vessels, that the excellency of the power may be of God, and not of us." And, Colossians 1:27: "..to whom God would make known what are the riches of the glory of this mystery among the Gentiles, which is Christ in you, the hope of glory." James Seward was born in Alabama, and raised in Tennessee. He spent summers with his grandparents in the wild back-country of Alabama. When he was six, his grandfather bought him his first set of oil paints, and as a young child he often painted his grandparents by lamp-light, to their great astonishment. "From the time I was five years old, I was continually painting and drawing in that great environment,” the artist remembers with fondness. After military service, Seward spent a year studying art under Howard Boyd Johnson at Watkins Institute in Nashville. In 1947, he enrolled at the Art Institute of Chicago, where he met his wife, Lyn. A year later they were married. After graduation, Seward apprenticed at two Chicago commercial art studios, but in 1954, the family moved to the midwest. After a year with an agency, he joined Union Gospel Press for the next six years. Since that time, Seward has been self-employed as a freelance illustrator and painter and has created works for most of the large protestant denominations including Standard Publishing in Cincinnati, the Methodists and Baptists in Nashville, the Concordia Lutherans in St. Louis, and the Nazarene Publishing House. Although the artist had attended church since childhood, after leaving for the Navy in 1944, he dropped his church attendance. In 1953, two former friends with whom he’d lost contact felt moved to pray for his salvation. And in 1954 when he and his family attended church with a neighbor, Jim and Lyn gave their lives to Christ.. Currently Jim is an ordained minister for the "Christ-Life Fellowship” headquartered in Dallas, Texas. He has spoken around the United States as well as in South Africa. He writes articles, makes teaching tapes and works on religious books. His religious paintings express his passion for Christ. Seward has completed over 22 illustrations for a Doubleday book entitled, Ancient Greece. In 1987 and 1989, he was one of 100 artists from around the country picked for the National Arts in the Parks Competition. James E. Seward has been commissioned for portraitures by many organizations. His paintings grace the walls of such companies as the General Motors Corporation, the Wells Fargo Bank, The McDonald Investment Company, and the Will Rogers Museum in Oklahoma.